When Martha Johnson died in the fire that consumed the trailer she was using as a temporary home on her farm near Covington, Tennessee, in July 1999, most everyone assumed it was a tragic accident. Turns out that it wasn’t an accident that killed 62-year-old Martha, described by many as a “shrewd, hard-nosed businesswoman;” it was an antique iron. The fire was just a cover-up set by her confessed killer, a general ne’er-do-well named Danny Winberry. If you believe the federal government and the 12 citizens who sat in judgment on him, it was Martha’s son Billy who hired Winberry to kill his mother with a down payment of $5,000 and promise of $45,000 more. But ask just about anyone else, including his brother, and they’ll tell you that Billy is an innocent man. Because Billy used the mail, telephone, and crossed state lines in furtherance of the murder conspiracy, he faced a federal, rather than state, jury. Some speculate that the case was usurped by the feds because state officials were not interested in pursuing an indictment. Ten years after his mother died in that conflagration, Billy was convicted of almost a dozen murder-for-hire related charges related to the tragedy. He was sentenced to life in prison, which in the federal system really means life. Almost everyone who testified for the government had a felony record and a motive to point the finger at Billy to save their own skins Most witnesses for the defense were related to Billy or Martha, or asserted that the government’s motive for the killing – greed – was as full of crap as the cow pastures where Billy and Martha worked side by side. Winberry, 42, a known gambler and burglar who remorsefully confessed to bludgeoning Martha to death with an antique iron he found in her house, cooperated with the government and received a 30-year prison sentence. In response to his help the government, which had an open-and-shut case against the felon, took the death penalty off the table. That was a smart move admitted Assistant U.S. Prosecutor Steve Parker. “There was no case without Danny Winberry. There’s no doubt he provided substantial assistance,” Parker told the judge at Winberry’s sentencing after Bill was convicted. Billy had much to gain from Martha’s death while the only reasonable motive that Winberry had to kill her without Billy’s financial promise was that she surprised him during a burglary attempt. On the other hand, one has to wonder why a contract killer would go to his victim’s house with the intent to kill her but without a weapon to do it. But then again, there are those two witnesses, farmhands Billy Archer and Jeremy Lawrence, who testified that Billy and his mother argued over the best use of the 520-acre farm, with Billy urging her to sell the property to real estate developers. Lawrence also testified that Billy offered him money in 1998 to kill Martha. Another farmhand, Lee Thomas, told a Tipton County deputy that Billy had twice offered him $10,000 to murder Martha in the fall of that year. Of course Thomas was in jail accused of burglarizing Martha’s trailer at the time he told Deputy Sheriff Ronnie Coleman about the offer, but he did make the assertion two months before the fatal fire. That’s a coincidence that lends credibility to his story. One of Martha’s close friends, Covington Fire Chief Jerry Craig, told the jury that in the weeks before her death, Martha talked to him about disinheriting her kin. She may have even done so: after she died Billy, her executor, told the Probate Court he could not find a legal will. As a result the court ruled she died intestate and divided her estate among her three surviving relatives. There was a big dispute between the government and the defense about the value of the property Martha didn’t want to sell. According to the feds, Billy made a little more $600,000 from the sale of the property, along with a $100,000 life insurance payout. But Billy didn’t sell the land to developers, he sold it to a neighbor who continued to farm it. After he received the windfall from his mother’s estate Billy must have had a good explanation why he told the other two heirs, his brother and a minor nephew, that the property was worthless and that they should sign waivers of claims to the estate. Jere Edwards, Billy’s brother, told Parker on cross-examination that the land was heavily mortgaged and worthless. An attorney retained by the family after Martha’s death determined that she owed more than the land was worth on the market, he said. “There was no way you could save that piece of property,” he told Parker. A forensic auditor testified for the government that the value of the estate was more than $1.1 million, while Martha had debts of more than $500,000. In the end it all boils down to Billy’s claim that he didn’t kill his mother because he loved her and had no reason to want her dead, and Winberry’s story that is backed up by several witnesses, albeit not the type of people you would trust with your debit card. According to Winberry, Billy first approached him at the JJ Lounge, which Billy operated with his mother. Over time the two men continued to talk about the plan and over the phone firmed up the agreement. They agreed on the $50,000 price with a 10 percent down payment. Winberry said they met in a Wal Mart parking lot where Billy patted him down for a wire, and assured that Winberry was clean, gave him $5,000 cash. Shortly thereafter, both Winberry and his then-girlfriend Rebecca Haynes Johnson (Whether there is a relationship to Billy or Martha there is unknown, but this is rural Tennessee) testified that he showed her the large wad of bills. On July 19, 1999, Billy called Winberry from a payphone and told him that he was leaving with family and friends for a vacation in Hot Springs, Ark., that weekend, giving him an alibi. Billy reportedly suggested that would be a good time to commit the murder. Winberry and Haynes Johnson each said that he asked her to provide him with an alibi for a robbery. She agreed. Then Winberry pressed her. On July 22, Martha and some hands were mowing hay when the mower broke and needed welding. As a result they left the field early, dropped off the part and stopped for groceries. The witnesses said they last saw Martha at her trailer around 5:15. Late that night Winberry entered the house – he said he had a key from Billy – and bludgeoned Martha to death with an antique iron he found there. In an effort to cover up the crime he placed a kerosene lamp on top of a lit stove, hoping that the heat would break the lamp and ignite the kerosene. Haynes Johnson testified that in the early hours of July 23, Winberry borrowed a rag and lighter and returned to the trailer, which had not burned. He dumped some kind of accelerant in the bedroom and torched the place. The two ate breakfast together every morning and, according to Billy, didn’t need business contracts to run their 275-head cow farm together. “She took my word and I took her word,” Johnson told Parker from the stand when the prosecutor asked why there was no paperwork showing a legal partnership. “Where’s the proof,” Parker asked. “I have a hurt back showing all the work I put in on it,” Johnson said. Parker then asked Johnson why his name wasn’t on any of the deeds that showed property ownership. “My name was in her heart and that was good enough for me,” Johnson said. At first the incident was considered a tragic accident, but like things do when you’re dealing with skells like Winberry and his pals, people started to talk. When there was enough talk and a belated autopsy showed that Martha was dead before the fire started, a criminal investigation began. At first there was nothing solid against Billy, but over time when the trail led to Winberry — who never received or even asked for the $45,000 after Billy received his windfall — and the law started leaning on him, the burglar/arsonist/murderer had a change of heart and confessed to killing Martha. Then he pointed the finger at Billy and the pieces started coming together. Winberry was indicted in 2004 for his role in the murder-for-hire plot and the investigators started to build their case against Billy. Up until Winberry was indicted, Billy and his family had been cooperating with authorities in the probe, but that stopped once Parker told Billy’s wife, Vicki, that her husband had become a suspect. “I told him he was wrong, that Billy was being very truthful,” Vicki said in court. Billy’s appeals were all in vain and he sits today in a federal prison in Louisiana. His family continues to insist on his innocence. Brotherly love was no match for greed and power as far as the Levine brothers, Donald and Robert, were concerned. The brothers were real estate developers with properties in Arizona and the Midwest during the 1980s until the bottom fell out of the real estate market out west and forced Robert to go to his brother with hat in hand for a bailout. In the spring of 1989, while Robert and Patricia were vacationing in Italy, Donald threw the first stone that would eventually lead to the murder of him and his wife and the attempted murder of their son, Mark. In a fit of rage, Donald accused his brother and sister-in-law of cheating him and mismanaging funds in one of their partnerships. Threatening to have them jailed, Donald kicked in the locked door of Robert’s office, and canceled management contracts held by a corporation mostly owned by Robert and Patricia. He also spread word of his mistrust to other partners, damaging his brother’s reputation. When Robert returned from Italy, he hired an attorney and threatened a libel suit against his brother. The attorney managed to mediate a truce between the brothers that allowed Donald to assume almost total control of Robert’s business interests, although on paper, the brothers were equal partners in the real estate holdings. Part of the agreement required Robert and Patricia to repay $110,000 to the new partnership and Donald withheld Robert’s salary until he signed the new partnership agreement. An uneasy peace remained in place during the summer of 1989, but the new agreement essentially ruined Robert and Patricia financially. They lost control of the management contracts they formerly held and were forced to lay off employees. In September 1989 the strained relationship soured once again when Marsha Levine told a business associate that Robert “better hope that Donald lived a long time,” because when he was gone, she intended to put Robert and Patricia “out on the street.” Her comments were made around the same time that Donald told another associate that he once again suspected Robert of stealing, adding that he intended to travel from Chicago to Phoenix to audit the partnership’s financial records and to formally end his business with his brother. While this was going on, Robert was planning in his own way to end the partnership. He contacted a former employee whose own fortunes had gone south when he was laid off from Robert’s management company and began to induce the man, Bruce McKinney, to kill Donald, Marsha and their son, Mark. Over the next several weeks, McKinney and Robert spoke frequently, and Robert promised McKinney that he “would make him a millionaire” if he agreed to do the killings. As another inducement, Robert told McKinney that if he did not murder Donald and his family, “the mob” would kill McKinney’s. Robert gave McKinney $400 to pay his utility bill and for the purchase of a shotgun. Robert also gave McKinney a .25 caliber automatic pistol from Robert’s mother’s house, a suitcase to transport the guns, and a sixty dollar check for bullets. McKinney bought ammunition for the shotgun and the .25 automatic. McKinney also bought exploding bullets for his own gun, a Ruger .357. The men flew to Munster, Indiana, where Donald and Marsha lived, staked out the house for a couple of days and returned to Arizona. A few days after that trip, McKinney traveled to Cincinnati, where he planned to murder Mark, who was living there. After riding in an elevator twice with Mark, but never being able to catch him alone, McKinney abandoned that plan and returned to Phoenix. The opportunity to kill next arose when Mark returned to Illinois in early November 1989 to be admitted to the Illinois bar. McKinney arrived in Munster on November 9, and posing as a package delivery man, approached the Levine home. Mark was working in the garage. McKinney entered the garage, pulled the .357, and ordered Mark into the home. He ordered Mark to lie on the floor and struck him on the head with the pistol. Marsha, hearing the commotion, came into the room and McKinney shot her in the chest, fatally wounding her. Donald then came out of the bathroom and McKinney shot him. He then turned to kill Mark, only to find the young man had fled. In frustration, McKinney put another bullet into Marsha’s body and left the home. Mark managed to get to a school across the street where he reported a burglary and shooting. He noticed that McKinney’s car was gone and returned home only to find his mother dead and his father conscious, but dying. After the shooting, McKinney called Robert and told him that Donald and Marsha were dead, but that Mark escaped. After hearing the news of Mark’s escape, Robert cursed and said that he would handle Mark. McKinney drove back to the airport and flew to Phoenix. Robert immediately left Phoenix for Munster, arriving at the hospital around midnight. Mark, suspicious of his uncle, refused to meet alone with him. Witnesses later recounted how this refusal visibly angered Robert, who tried to convince Mark to travel to Chicago with him until he could be relocated to a safe apartment. Mark again refused, and for months after the killings wore a bullet-proof vest under his clothes. Robert instructed McKinney to keep his mouth shut because Robert was a suspect. After Robert returned to Phoenix, McKinney returned the .25 automatic to him. About a month after the murders, Robert gave McKinney $600 and told McKinney not to contact him until after January 15, 1990. Police were examining Robert’s background and saw the transactions and telephone calls with McKinney. When it turned out that McKinney was in Chicago around the time of the murder, he was arrested in Phoenix on December 22, 1989. Authorities suspected they had the shooter, but it was the person who hired McKinney who they really wanted. Robert was taken to police headquarters the same day, questioned and released. In September 1990, McKinney agreed to cooperate with the FBI to avoid the death penalty for the murders of Donald and Marsha Levine and the attempted murder of Mark Levine. McKinney pleaded guilty to murder and received immunity on murder-for-hire charges from the government for his testimony. Robert and Patricia became fugitives for four months. They did not leave a forwarding address and even family members did not know where they went. In fact, Robert and Pat went to southern California. In Costa Mesa, Robert rented a voice mail service and a private mail box under the alias Steven B. Rosenberg with his wife as Pat Green. Jeffrey Ross, one of Robert’s lawyers, was advised of a scheduled appearance of Robert before the grand jury on January 10, 1991. Still in hiding, Robert did not appear before the grand jury, but called his brother-in-law from an unknown location to express his regret that the man had been dragged before the grand jury. 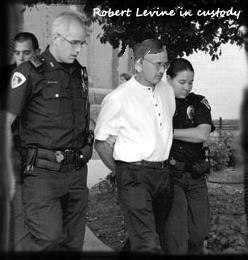 Robert Levine finally surrendered to the authorities in California on March 4, 1991. After he turned himself in, Robert was incarcerated at the Metropolitan Detention Center in Los Angeles. His cellmate was John Rinaldo. Robert and Rinaldo realized that they knew each other from the real estate business and had met during the 1970s. Robert unwisely decided to confide in Rinaldo. Ironically, Robert complained to Rinaldo that if McKinney had only kept quiet, Robert would not have his current problem. He described the murder victim only as a business associate who falsely accused him of stealing money. Robert said that the Mafia persuaded him to commit the murder because the business associate was involved with the Mafia in a money laundering scheme and had reneged on a deal. Robert told Rinaldo that he traveled to Chicago with McKinney and said that he was concerned because he used an alias but used his credit card for a car rental. All of this of course ended up being told the jury which returned guilty verdicts against Robert Levine on all five counts of the indictment. His alternative theory of the case was that Mark Levine had hired McKinney to murder his parents. The district court fined him $250,000 and sentenced him to life in prison.